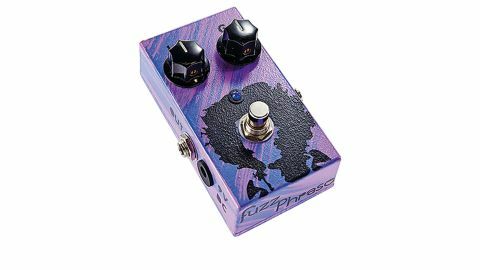 Sweet-sounding fuzz, but it doesn't come cheap. Expressive fuzz. Cleans up really well. You have to find the sweet spot. Designing a vintage-sounding fuzz pedal - as Greek firm JAM's handmade Fuzz Phrase claims to be - has a lot to do with choosing the right transistors and matching them. "We liked the sound best with the level knob on max while dialling in the dirt at mid settings"
For this Fuzz Face-style pedal, JAM has chosen the rare CV7003, military-spec version of the OC44 germanium transistor, which it says is consistent and heat-resistant (germanium transistors can be susceptible to temperature changes) - more so than the more commonly used AC128 and NKT275. We liked the sound best with the level knob on max while dialling in the dirt with the gain knob through a nice overdrive at mid settings to the last bit of travel, which brings out the top end and a richer fuzz. It's about finding the sweet spot, though, and edging the gain back worked for us, although running it flat-out and controlling things with your guitar volume may be the way to go, as it cleans up really well.